const char * COMPILE_QUEUE_TITLE = "Recompilation Progress"
const char * COMPILE_START_STRING = "recompile"
const char * RESET_QUEUE_TITLE = "Reset Progress"
const char * RESET_START_STRING = "reset"
const char * RUN_QUEUE_TITLE = "Set Running Progress"
const char * RUN_START_STRING = "set running"
const char * NOT_RUN_QUEUE_TITLE = "Set Not Running Progress"
const char * NOT_RUN_START_STRING = "set not running"
const char* COMPILE_QUEUE_TITLE = "Recompilation Progress"
Definition at line 67 of file llcompilequeue.cpp. 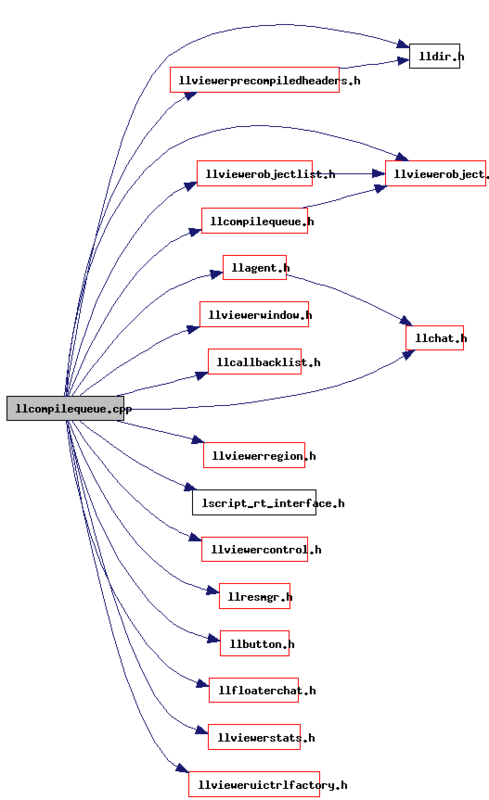 const char* COMPILE_START_STRING = "recompile"
Definition at line 68 of file llcompilequeue.cpp. const char* NOT_RUN_QUEUE_TITLE = "Set Not Running Progress"
Definition at line 73 of file llcompilequeue.cpp. const char* NOT_RUN_START_STRING = "set not running"
Definition at line 74 of file llcompilequeue.cpp. const char* RESET_QUEUE_TITLE = "Reset Progress"
Definition at line 69 of file llcompilequeue.cpp. const char* RESET_START_STRING = "reset"
Definition at line 70 of file llcompilequeue.cpp. const char* RUN_QUEUE_TITLE = "Set Running Progress"
Definition at line 71 of file llcompilequeue.cpp. const char* RUN_START_STRING = "set running"
Definition at line 72 of file llcompilequeue.cpp.